Judge Maurice Caruana Curran (1918-2015) lived until his late 90s, enjoying a long and eventful life. 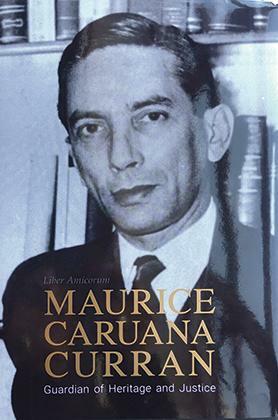 A number of his friends and former colleagues have gathered in the book Maurice Caruana Curran: Guardian of Heritage and Justice to pay their respects to his memory and to commemorate his life in writing. Their collection of warm and personal tributes to him are now published and available to read in this nicely-presented Liber Amoricum. Anyone who knew the distinguished judge will surely enjoy going down memory lane with them. Besides his eminent legal career, he was active in sports, enjoyed acting on the theatre stage and writing poetry. I met him as founding president of the non-governmental organisation Din l-Art Ħelwa. 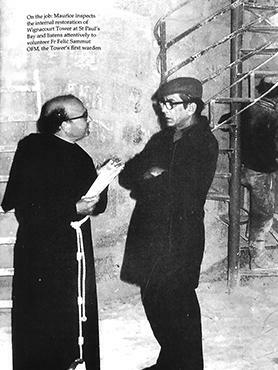 He had established the organisation years before, in 1965, with a group of other interested friends, to campaign for the protection of Malta’s built and natural heritage. This was a sign of the times, as, following Malta’s attainment of independence in 1964, there was a surge of interest in Maltese identity – in its traditions and language as well as its architecture and landscapes. Today, Din l-Art Ħelwa is still going strong as one of the oldest environmental NGOs active in Malta. Caruana Curran, who died four years ago this month, led Din l-Art Ħelwa for 33 years, then handing the reins to the renowned archaeologist Anthony Bonanno, one of the three editors of this volume of essays, with Ann Gingell Littlejohn and Judge Joseph Galea Debono. Bonanno was followed as the organisation’s president by Martin Scicluna and Martin Galea. Another sign of the times is that three women then stepped into the leadership role, beginning with my own election as Din l-Art Ħelwa president in 2010 and followed by Caruana Curran’s daughter, Simone Mizzi, and then Maria Grazia Cassar. For as long as his health permitted, Caruana Curran continued to attend events at the Din l-Art Ħelwa headquarters in Melita Street, Valletta, next door to his former family residence. He was 50 years older than me, so our paths at Din l-Art Ħelwa only crossed briefly but I clearly remember his final years when he would still appear at the top of the steep staircase, determined to attend a lecture or social event, or to address an audience of members. The strength and continuity of the organisation he founded is attested by the fact that all its former presidents remained engaged in its activities and development well after their terms ended. Caruana Curran’s wife, Ċettina, also continues to be actively involved. His legacy in the heritage field is central to Caruana Curran’s achievements but many of the contributors to this volume remember him best in his principal role, as a lawyer and judge working in the law courts of Valletta. He retired in 1983, after a distinguished legal career. He is well-remembered for his involvement in some very high-profile cases. His many interests and activities provide the framework of the book, its arms and legs, but its beating heart is the man himself. The volume begins with a foreword and introduction by Prosper Cardinal Grech and a prologue with biographical details and personal memories of her father by Simone Mizzi. The first section, entitled ‘Up Close and Personal’, contains further memories of Caruana Curran by Victor Aquilina, Nicholas de Piro, Norbert Ellul-Vincenti, Albert Ganado, Austin Gatt, John Mamo, Peter Vassallo and Paul Xuereb. A genial picture emerges of a sociable, intelligent, amiable man who enjoyed notably long conversations, both face-to-face and over the telephone. His never-ending calls are fondly remembered, perhaps describing his latest favourite book to a friend, or interrupting the busy editor at the Times of Malta to dissect an article or discuss the latest cricket results. This personal side of the book is enriched with numerous photos documenting moments of his life. The descriptions and appreciation of Caruana Curran’s work in the legal field, mostly written by former students and colleagues, are of particular interest. This second section, entitled ‘Of Justice and Heritage’, contains contributions by Carmel A. Agius, Kevin Aquilina, David J. Attard, Austin Bencini, Giovanni Bonello, Tonio Borg, Joseph A. Filletti, Henry Frendo, Michael Frendo, Joseph Galea Debono, Joseph Micallef Stafrace, Ugo Mifsud Bonnici, David Scicluna and Francis Zammit Dimech. Collectively they describe his detailed and significant court judgmnts, his legal insights and sense of fairness, his distinctive and elaborate use of language and his strong presence and sense of drama in the courtroom. He was clearly an extrovert who liked telling a story and people enjoyed listening. Five years after his retirement, in 1988, Caruana Curran was appointed chancellor of the University of Malta. But at this period of his life, the focus of the book shifts to his involvement in the heritage sector. This third and final section of essays, entitled ‘Of Heritage and the Environment’, contains contributions by Evarist Bartolo, Anthony Bonanno, Mario Buhagiar, Richard England, James Evans, Stanley Farrugia Randon, Louis Galea, Martin Galea, Sneska Quaedvlieg-Mhailovic, Martin Scicluna, Ray Vassallo, Roger Vella Bonavita, Alexander Norton Welsh and Maria Grazia Cassar, with a final touch by Philip Farrugia Randon. Caruana Curran may have been a great talker but he is also remembered as a good and sensitive listener. He lived through some turbulent times, badly affected by political events and personal trauma. His deep grief at the tragic, accidental death of his younger daughter, Louise, in 1968, aged 13, surfaces repeatedly in the essays. He then lost his first wife, Katie, and experienced a tough period in the law courts. Anyone interested in these stories and events, or in his achievements in the legal field, can refer to these insightful essays by fellow-travellers. Along the way, they touch upon a tense and difficult period in the 1970s that shaped Caruana Curran’s life and career.